Phish is an American rock band noted for its musical improvisation, extended jams, exploration of music across genres and devoted fan base. Formed at the University of Vermont in 1983 (with the current line up solidifying in 1985), the band's four members - Trey Anastasio, Mike Gordon, Jon Fishman, and Page McConnell -- performed together for over 20 years before breaking up in August 2004. They reunited March 2009 at the Hampton Coliseum in Hampton, Virginia, and have since resumed performing regularly. Phish's music blends elements of a wide variety of genres, including rock, jazz, progressive rock, psychedelic rock, hard rock, funk, folk, bluegrass, reggae, country, blues, avant garde, and classical. Each of their concerts is original in terms of the songs performed, the order they appear in, and in the way they are performed. 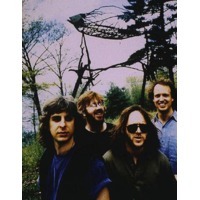 Although the band has received little radio play or mainstream exposure, Phish -- much like the band it is most often compared to, the Grateful Dead -- has developed a large and dedicated following by word of mouth, the exchange of live recordings by trading tapes with other fans and selling over 8 million albums and DVDs in the United States.Rolling Stone stated that the band helped to "...spawn a new wave of bands oriented around group improvisation and superextended grooves."